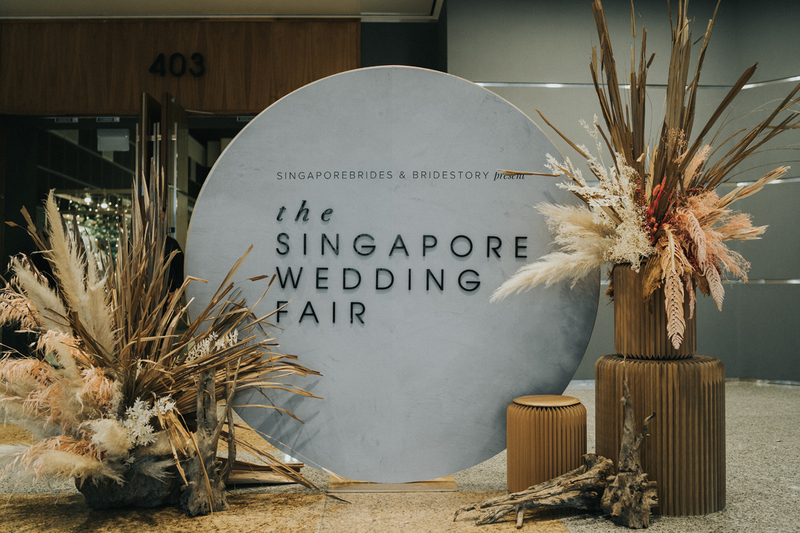 With exclusive wedding offers and packages, amazing prizes and cashback, beautiful inspiration, and delicious food tastings, The Singapore Wedding Fair 2019 was a fun weekend for the whole wedding party! We welcomed 6,000 attendees to The Singapore Wedding Fair over the past weekend, 30-31 March 2019! Held in Suntec Convention Hall 403 from 10am to 10pm daily, the wedding fair was a refreshing alternative to the traditional wedding expo, with gorgeous wedding inspiration and styling in a modern Moroccan theme, and a handpicked selection of creative wedding vendors. Presented by SingaporeBrides and Bridestory, the wedding fair saw a huge crowd of 6,000 soon-to-wed couples along with their family and friends. They enjoyed a fun weekend of incredible wedding deals, such as $6,600 worth of exclusive perks from Andaz Singapore, or special wedding packages with $128 cash rebates per table and free flow of beer and wine from Novotel Clarke Quay. The couples also took advantage of exclusive wedding packages and offers from Singapore’s most sought-after bridal boutiques, photographers, videographers, makeup artists, jewellers and florists. With so many amazing wedding vendors and exciting offers, it was no wonder that The Singapore Wedding Fair’s Flash Prizes were won within 15 minutes of the event opening on Saturday, and only 5 minutes on Sunday! Queues started half an hour before doors opened, and the couples who made the first six transactions of the day walked away with wonderful instant-win prizes such as a three-hour pre-wedding shoot with Multifolds Productions, a $1,000 cash voucher from Jessicacindy, or staycations from Regent Singapore and Hotel Jen Tanglin Singapore by Shangri-La! To inspire couples planning their weddings, the hall was decked out in lush wildflowers and golden grasses in the modern Moroccan theme. The couples met with a carefully curated list of over 70 wedding vendors, and were inspired by gorgeous wedding dresses and stunning photography and videography displays. They also had fun at the photo booths, and sampled delicious bites such as ice cream from Manna Pot Catering and chocolate caramel eclairs from Regent Singapore. The Singapore Wedding Fair welcomed celebrities such as Shu An and soon-to-wed influencers such as Si Pei and Elaine Rui Min, who got their selfie game on at the gorgeous concept area, featuring wild grasses in hues of blush, gold, and coral. Attendees who posted their selfies on social media and tagged The Singapore Wedding Fair were eligible for an exciting turn of the Instant Win Coin Machine, where they could win Sephora and Starbucks vouchers, and cute limited edition pins and tote bags! Every $200 spent during the fair entitled couples to a chance at the Grand Draw for $20,000 cashback, as well as a chance at the Instant Win Coin Machine. At 9pm each day, huge crowds gathered for the Grand Draw. Nine lucky couples won a total of $20,000 in cashback for their purchases from Alisha & Lace, Luna Bianca Bridal, and Andaz Singapore, among other vendors! We’d like to thank the Bridestory team as well as all the vendors who made The Singapore Wedding Fair such a huge success! Credits: Images by The Beautiful Moment Photography and SingaporeBrides | Videography by Substance Films | Supported by Floral Magic, Med Karlek Inc., XOXO & Co., Impressario, and HipVan. Feature image by The Beautiful Moment Photography.